Ah, Porco Rosso! 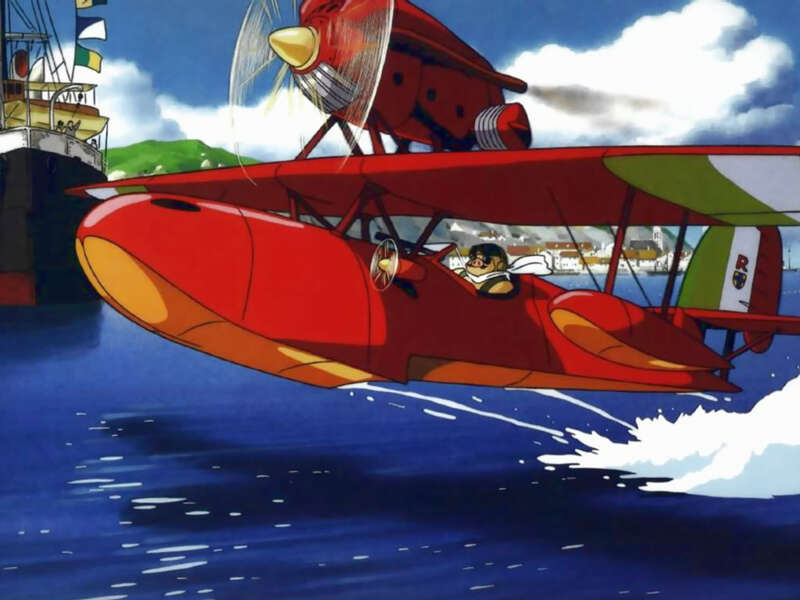 Undoubtedly the most hilarious of Ghibli’s films, Porco Rosso is the story of a smarmy Italian fighter-pilot-turned-seaplane-bounty-hunter, who for some unexplained reason was cursed to look like a pig. And, hilariously, like his piggish face, the hero himself is piggishly stubborn, chauvinistic, and terse. After skirmishing and consistently foiling a bumbling gaggle of seaplane pirates, Marco (Porco Rosso’s given name) finds himself in a begrudging rivalry with a brash, obnoxious, fellow-womanizing, southern-accented American pilot. And to make the plot more interesting, Marco’s plane engineer is a spunky 17-year-old Italian girl named Fio, who offers herself as the prize should Marco lose his duel with the haughty Texan. Ah, yes, what humor ensues when the Japanese combine these characters and situations with an utter disregard for social or political correctness! The English voice acting is especially awesome in Porco Rosso‘s Disney release: Michael Keaton takes the lead with his deadpan portrayal of our lovably droll and misogynistic hero, Cary Elwes lends the Texan drawl to Marco’s American rival, and David Ogden Stiers gives an absolutely delightful performance as Fio’s Italian engine-mechanic grandfather! Once again, Joe Hisaishi’s score (this time with a hefty dose of Mediterranean flare) gives the film a light and adventurous tone. The animation is incredible in its scope and action, highlighted by the exciting air fight scenes, and the fast-moving landscapes. The film feels like a relic from those classy, brash, and neo-romantic 1920’s-40’s wartime days. But even with all its exaggerated stylization, it maintains Ghibli’s signature fantastical, imaginative flair. If it had a little more substance, I’d give it 5 stars. As it is, it’s certainly one of Ghibli’s most recognizable and beloved works — utterly delightful in every way! Pros: brilliant voice acting, excellent animation, so. much. fun., general hilarity, unabashed political incorrectness, exciting air fights, lovable characters, beautiful music, interesting ambiguous ending, overall unforgettable-ness!